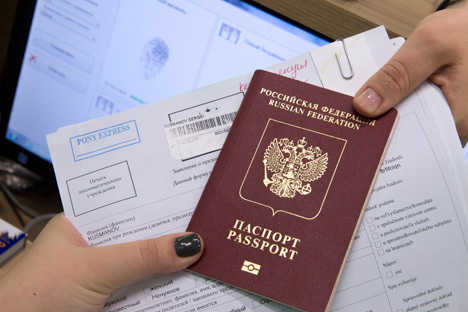 Russians believe that Russia and Ukraine should be with open borders and without visas or customs. Half of Russians (52 percent) believe that Russia and Ukraine should be independent countries but friends, with open borders and without visas or customs, Levada Center told Interfax. The opinion was held by 52 percent of respondents in 2015, and 59 percent in 2014, the sociologists said. A third argue that Russia-Ukraine relations should be no different from Russia's relations with other states - with closed borders, visas and customs (that view is shared by 32 percent of respondents now, 33 percent a year ago, and 19 percent in 2014). A tenth of respondents (11 percent) share the opinion that Russia and Ukraine should unite into a single state. The indicator stood at 8 percent last year, and 16 percent in 2014. Two-thirds of respondents (65 percent) do not agree that Russia and Ukraine are at war with each other (24 percent support this opinion, and 11 percent are 'undecided'). Some 83 percent of the 1,600 respondents polled in 137 populated localities in 48 Russian regions on January 22-25 support Crimea's accession to Russia. In the opinion of Russians, the accession of Crimea has had more 'pros' (61 percent) than 'cons' (20 percent). Nineteen percent are 'undecided'. The Ukraine developments are being monitored by 81 percent of respondents. Most Russians see the situation in eastern Ukraine as 'tense' (65 percent), 14 percent call it 'critical and flammable', and 12 percent claim it is 'calm'.